Ann-Margret Hovsepian, a freelance writer and illustrator from Montreal, Quebec, was the keynote for InScribe’s 2018 Fall Conference. After the weekend was over and feedback came in, many participants felt hers were some of the most meaningful addresses they had heard. She certainly focused on God and using one’s writing for His glory – something that fit very well with our organization’s revised mission statement which reads: “We minister to writers so they can minister to others”. Her messages were steeped in Biblical truth and she continually brought us back to the point that as Christian writers, no matter what genre we write in, it is our responsibility to represent God well. 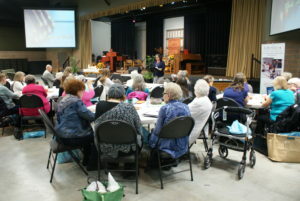 Ann-Margret gave three keynote addresses based on the conference theme “The Art of Words” and the key verse from Psalm 45: 1 – “My heart is stirred by a noble theme as I recite my verses for the King; my tongue is the pen of a skillful writer.” (NIV) She cleverly dissected this verse into three sections and spoke on each one. It sounds like you thoroughly enjoyed her presentation!